Keeping pipeline rights-of-way clear of structures, trees and other obstructions is necessary for public safety and reliable energy delivery. A clear right-of-way is an important indicator of underground facilities to third parties who may be performing nearby construction. Direct and immediate access to a pipeline enables Millennium to conduct testing to monitor the pipeline’s integrity and to perform general maintenance and repairs. In the event of an emergency, a clear right-of-way is necessary for adequate response from both Millennium personnel and emergency response officials. A clear right-of-way enables safer and more effective patrols and inspections. As part of its overall safety program, Millennium works to keep its rights-of-way clear. When necessary, we may clear trees, shrubs and other obstructions that may interfere with the inspection, maintenance and operation of our pipelines. Structures like sheds, swimming pools and anchored playground equipment are also prohibited from rights-of-way. 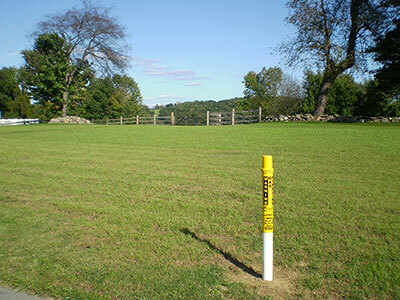 Learn about allowable planting along a pipeline right-of-way. – Mowing and spraying along the right-of-way. Millennium conducts both aerial and ground patrols of its pipelines. Aerial surveillance may identify signs of a leak or damage. Aerial patrols may also spot activities occurring near a pipeline that may threaten its safety or integrity. Ground patrols are conducted also to look for signs of leak or damage and to ensure the absence of extensive landscaping or other obstructions that block the view of or impede access to a pipeline. A “blowdown” is a release of natural gas from a pipeline system. Blowdowns are performed to take a pipeline section out of service for maintenance or construction. A blowdown may create a loud roaring sound and lingering gas odor in the surrounding area. Since blowdowns are conducted under carefully controlled circumstances, they pose no danger to local citizens. Mowing and/or spraying along a pipeline right-of-way helps control growth and prevent obstructions from growing that may interfere with the inspection, maintenance and operation of the pipeline.